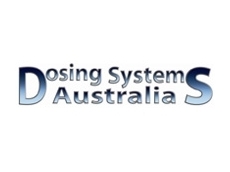 Formerly known as Dosmatic Australia~New Zealand, Dosing Systems Australia is a company concentrating on the distribution of chemical injection equipment whilst providing genuine customer care and support. Volumetric dosing or metering is water driven and the injection rate remains proportional to the water flow. The water flow can increase or decrease but the percentage injected remains the same. Electric metering pumps inject a prescribed volume of concentrate into a flow of liquid based on time, pulse or logic input from a controlling device. Proportional injection is achieved by incorporating additional equipment such as a flow monitor and controller. MixRite - Water Driven Injector The MixRite is a Volumetric dosing or metering pump. That is, it is water driven and the concentrate is injected proportionally into the water flow. The entire flow of water drives the motor piston, the flow can vary in volume or the pressure can fluctuate but the chemical injected remains proportional to the water flow.MixRite is one of the first companies to Purpose Build water driven technology designed to be used with harsh chemicals such as chlorine & acids.The MixRite is manufactured in Israel by Tefen Industry specific models are manufactured; The CL range is built to be used with Chlorine. The CW range is built to be used with chemicals typically used in the car wash industry.PVDF models available in certain flow and Injection ranges.Careful consideration must be given to make sure the correct MixRite is selected to ensure compatibility with the chemicals to be injected.Please contact Dosing Systems Australia to ensure the right construction materials are selected to meet the requirements of your process. LMI Milton RoyLMI Milton Roy manufactures an extensive range of electric metering / dosing pumps that include Solenoid Driven Diaphragm, Motor Driven Diaphragm and Stepper Motor Driven diaphragm technology.LMI’s P Series, B Series, C Series & J Series are solenoid driven and are available in various control configurations. Basic On/Off, Pulse and 4-20mA.LMI produce models suitable for: SlurryHigh ViscosityHigh PressureExplosion ProofDe-Gassing ChemicalsGeneral Chemicals 12 Volt The Milton Roy Series G™ dosing pumps are electric motor-driven (240v or 415v) pumps with mechanical diaphragm liquid ends. The G Series are rugged, simple and very reliable. 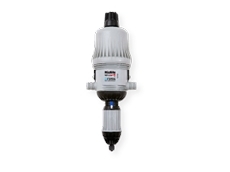 They are optioned with a range of Liquid End materials including Polypropylene, PVDF and 316 Stainless Steel.The Milton Roy Series G™ can also be configured to dose high viscosity and slurry style concentrates.The Series G™ can dose into pressures up to 12 bar and in volumes up to 1800 Litres Per Hour.Series G™ come standard as On/Off control with 1 to 100 stroke length turndown.The Series G™ can also be configured with Variable Speed Drives that can be controlled by 4-20mA flow sensors that provides proportional dosing.The new LMI EXCEL XR Metering Pump utilizes stepper motor technology paired with diaphragm metering that provides premium accuracy +/- 1% over 1000:1 turndown. 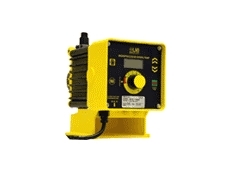 Two way communications offers the process manager optimum control and feedback.The LMI EXCEL XR is offered in three model configurations; Basic Manual, Enhanced and Communication Version.A range of Liquid End Materials are offered to deal with the widest range of chemicals; Polypropylene, PVDF & 316 Stainless Steel.Multiple Voltage: 100 to 240 volt ACHarsh environment protection: NEMA 4X/IP 65 housing. Dosmatic - Water Driven Injector The Dosmatic injector is a non-electric water driven pump that simply and precisely injects liquid chemicals into a water line. 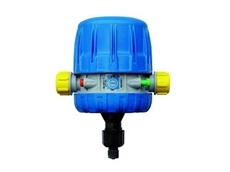 The Dosmatic is a Volumetric dosing or metering pump. That is, it is water driven and the concentrate is injected proportionally to the water flow. The entire flow of water drives the motor piston, the flow can vary in volume or the pressure can fluctuate but the chemical injected remains proportional to the water flow.The Dosmatic range is excellent for water flows up to 100 Litres Per Minute and is ideal for the Horticultural & Animal Health Industries.The Dosmatic MiniDos has high injection capabilities, up to 20% into a maximum flow of 27 Litres Per Minute.Previously, Dosing Systems Australia was known as Dosmatic Australia~New Zealand.Extensive wear parts inventory along with a service facility for full repair, service and testing of all Dosmatic models is available with Dosing Systems Australia. 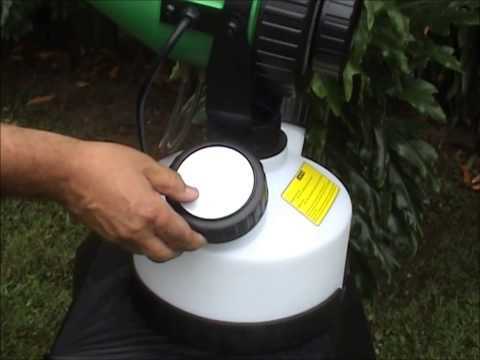 SprayFog ULV SprayerBuilt for heavy duty usage and powered by a 1350 watt motor, the SprayFog ULV Fine Droplet Sprayer/ Cold Fogger from Dosing Systems Australia is a tough machine. Designed by a team of people with over 100 years’ experience between them, the building process is a combination of knowing what works and what doesn’t. All parts are easily replaced if accidently damaged. 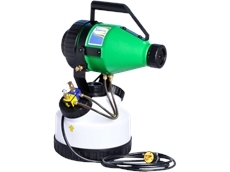 With term serviceability built in, the SprayFog ULV Fine Droplet Sprayer is designed to last. Chemical resistant polyethylene construction Brass fittings Whiteboard for recording chemical usage Precision Needle Valve with lockable settings Mechanical Pin tilt control Delivers 0-30 litres per hour of formula Australian Electrical Compliance Certification. Spraying low volumes of chemicals in either a mist or fog form provides effective treatment. 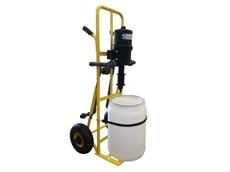 The ULV Sprayer has many uses and is built for heavy duty commercial applications Insecticides Disinfectants Fungicides Biocides Fumigants Deodorisers Fertiliser The SprayFog ULV Fine Droplet Sprayer is able to be stripped down and rebuilt quickly and efficiently reflecting its quality and serviceability. Enquiries for international distribution welcome. 30/04/18 - Dosing Systems Australia introduces a new range of mobile fertigation trolleys designed for production nurseries to micromanage individual plant nutrition requirements. These mobile fertigation trolleys can also be used to keep stock plants healthy in retail nurseries.Dosing Systems’ mobile fertigation trolley consists of a Dosmatic SuperDos 20 2.5% mounted on a trolley to provide an injection range of 0.2% to 2.5%. Being water-driven, SuperDos 20 doesn’t require electricity for operation. However different injectors can be incorporated depending on specific needs.The custom made fertigation trolleys can be tailored to suit specific requirements including multiple outlets to allow for more than one operator; larger pipework for higher water flows; and designated trolley for disinfection of work areas.The schedule 80 plumbing on the fertigation trolley allows for fresh water irrigation at the turn of a ball-valve. The inlet and outlet are positioned low near the wheels for stability when moving the hose. The fertigation trolley has a 30-litre concentration tank for extended in-field fertigation. 25/04/18 - MixRite offers a range of water driven injectors constructed from PVDF and suitable for volumetric dosing with harsh chemicals. PVDF or polyvinylidene fluoride, also known in the plastics industry as Kynar, displays exceptional chemical compatibility characteristics, and can be used in conjunction with an extremely wide range of chemicals without degradation.There is a high failure rate of volumetric technology brands when used with a range of chemicals. Consequently, volumetric injection technology has been deemed unsuitable for applications involving chemicals.Available from Dosing Systems Australia, MixRite’s injectors are made from PVDF, allowing for volumetric dosing with a far greater range of harsh chemicals. MixRite’s PVDF injectors are recommended for use with proprietary chemical blends when full disclosure of chemical compound is not known.PVDF offers excellent resistance to most acids, aromatic hydrocarbons and alcohols, and can also be used with a range of solvents and oxidising compounds.Contact Dosing Systems Australia to discuss the right injector for your requirements. 23/04/18 - Dosing Systems Australia has introduced a new system designed for simple and efficient fertigation of vertical gardens, greenwalls and indoor plant gardens.Tefen’s MixRite 1 is a compact-sized fertiliser injector that operates silently, making it ideal for installations in close proximity to showrooms or office space. 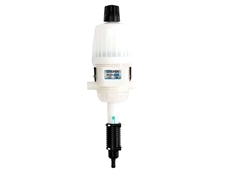 Recommended for drip fertigation where minimal irrigation is required, the injector will start injecting fertiliser at a flow rate of 0.33 litres per minute.For vertical gardens, the MixRite 1 has an adjustable injection rate of 0.2% to 2%. 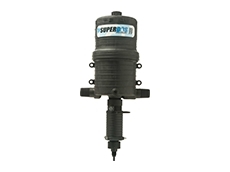 The fertiliser injector is designed for a maximum water flow of 16 litres per minute. Since the system is capable of operating at low flows, complete fertigation can be achieved with minimal wastewater being discharged to drainage, encouraging an environmentally responsible practice. 12/08/14 - Dosing Systems Australia offers metering pumps from LMI Milton Roy designed to deliver proven reliability and quality performance. Dosing Systems is the Australian distributor for LMI Milton Roy metering pumps.LMI Milton Roy metering pumps are available in a comprehensive range from simple entry level on/off dosing pumps, through to mechanical actuated metering pumps with 4-20mA control. LMI Milton Roy pumps compete very favourably with ProMinent, Alldos and Iwaki brands. LMI P746-352: Pulse Control, Boiler TreatmentSuitable for boiler treatment where pulse control is required, LMI P746-352 metering pumps deliver 2.2 litres per hour @ 17.3 Bar with pulse control or simple on/off control, making this range an excellent choice for cost-effective boiler dosing. 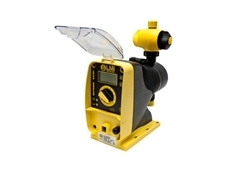 All LMI metering pumps come complete with suction tubing, discharge tubing and an injection valve.LMI U146-281: Entry Level Diaphragm Metering PumpA simple on/off control pump, the LMI U146-281 is ideally suited for situations that do not require elaborate control features. The LMI U146-281 will deliver 4.8 litres per hour @ 5.5 Bar. All LMI metering pumps come complete with suction tubing, discharge tubing and an injection valve.LMI P146-352: Boiler Metering PumpSuitable for boiler treatment, LMI P146-352 metering pumps deliver 2.2 litres per hour @ 17.3 Bar with simple on/off control making this model an excellent choice for cost effective boiler dosing. The P146-352 is available with the 3- or 4-function valve.All LMI metering pumps come complete with suction tubing, discharge tubing and an injection valve.